Larry Brian Radka is a retired broadcast engineer, an amateur radio operator (KB3ZU), and a graduate of the University of the State of New York. He has written several magazine articles as well as a few books. Historical Evidence for Unicorns and Astronomical Revelations or 666 were published in the mid 1990's and his latest release, in 2006, is The Electric Mirror on the Pharos Lighthouse and Other Ancient Lighting. It may be ordered by clicking: http://einhornpress.com/mirror.aspx. "Electric batteries, 2000 years ago!!! Surprised? No need to be, really," declared Willard F. M. Gray, an electrical engineer for General Electric. "There were some pretty smart metal workers in the ancient city of Baghdad, Persia [now Iraq]. They did a lot of fine work in steel, gold, and silver. You may wonder what this had to do with electric batteries. It seems that copper vases, some of whose ages go back 4000 years, were unearthed several years ago which had designs plated on them in gold or silver, even some were plated with antimony." These so-called Baghdad batteries, discovered in the 1930's, are now old news, and the evidence that the ancients used them to electroplate some of the artifacts stored in museums around the world is likewise common knowledge. Nevertheless, for readers who are not familiar with the discovery of these ancient electric cells, we will call on the German rocket scientist Willy Ley to update us. "Dr. Wilhelm Koenig of the Iraq Museum in Bagdad reported recently that a peculiar instrument was unearthed by an expedition of his museum in the summer of 1936. The find was made at Khujut Rabu'a, not far to the southeast of Bagdad. It consisted of a vase made of clay, about 14 centimeters high and with its largest diameter 8 centimeters. The circular opening at the top of the vase had a diameter of 33 millimeters. 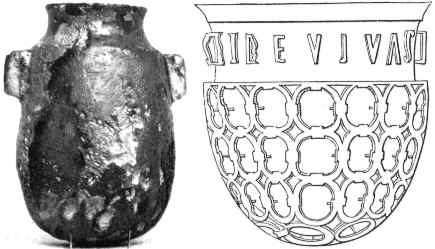 Inside of this vase a cylinder made of sheet copper of high purity was found - the cylinder being 10 centimeters high and having a diameter of about 26 millimeters, almost exactly 1 inch. "The lower end of the copper cylinder was covered with a piece of sheet copper, the same thickness and quality as the cylinder itself. The inner surface of this round copper sheet - the one that formed the inner bottom of the hollow cylinder - was covered with a layer of asphalt, 3 millimeters in thickness. A thick, heavy plug of the same material was forced into the upper end of the cylinder. The center of the plug was formed by a solid piece of iron - now 75 millimeters long and originally a centimeter or so in diameter. The upper part of the iron rod shows that it was at first round, and while the lower end has partly corroded away so that the rod is pointed now at the lower end, it might be safely assumed that in the beginning it was of uniform thickness. "An assembly of this kind cannot very well have any other purpose than that of generating a weak electric current. If one remembers that it was found among undisturbed relics of the Parthian Kingdom - which existed from 250 B.C. to 224 A.D. - one naturally feels very reluctant to accept such an explanation, but there is really no alternative. The value of this discovery increases when one knows that four similar clay vases were found near Tel'Omar or Seleukia - three of them containing copper cylinders similar to the one found at Khujut Rabu'a. The Seleukia finds were, apparently, less well preserved - there are no iron rods in evidence any more. But close to those four vases pieces of thinner iron and copper rods were found which might be assumed to have been used as conductive wires. "Similar 'batteries' were also found in the vicinity of Bagdad in the ruins of a somewhat younger period. An expedition headed by Professor Dr. E. Kühnel, who is now director of the Staatliches Museum in Berlin, discovered very similar vases with copper and iron parts, at Ktesiphon - not far from Bagdad. These finds date from the time when the dynasty of the Sassanides ruled Persia and the neighboring countries - 224 A.D. - 651 A.D.
"While the probable date of the invention is entirely open to conjecture, it seems likely that it was made in or near Bagdad, since all known finds were made in the vicinity of this city. It must be assumed, of course, that the subjects of the Sassanides had some use for them, and Dr. Koenig, the discoverer of the best preserved of all these vases, suggests that this use might still be in evidence in Bagdad itself. Electrogilding or electroplating basically only requires rods or wire, a couple of simple electric cells (batteries) connected to a bath of common chemicals wherein the items to be electroplated are placed. However, beside the materials already mentioned, using glass, lead, zinc, and some types of electrolytes like caustic soda and sulfuric acid produce stronger types of non-rechargeable Bagdad-types of primary batteries - as well as powerful rechargeable storage or secondary batteries that could have been used for ancient electric lighting. Bronze Age people made glass around 3,000 B.C., and the Egyptians manufactured glass beads about 2,500 B.C. 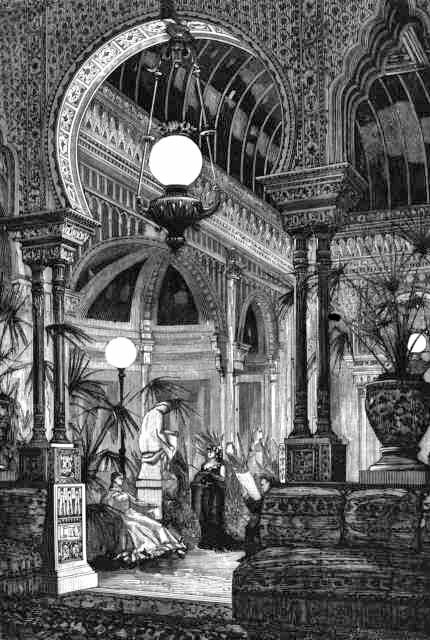 Later, Alexandrians manufactured modern types of glass, during the Ptolemaic period - when the Pharos Lighthouse rose up. Prehistoric man smelted Lead. One old piece of lead work in the British Museum dates back to 3,800 B.C. Several millenniums later, Romans were using it at length in their cooking pots, tankards, and plumbing; and many probably poisoned their brains in the process. The resulting insanity may have eventually contributed to the fall of the empire. "In 1968, Dr. Koriun Megurtchian of the Soviet Union unearthed what is considered to be the oldest large-scale metallurgical factory in the world at Medzamor, in Soviet Armenia. Here, 4,500 years ago, an unknown prehistoric people worked with over 200 furnaces, producing an assortment of vases, knives, spearheads, rings, bracelets, etc. In the course of the excavation of the Agora in Athens, a roll of sheet zinc, 98% pure, was supposedly found in a sealed deposit dating from the 3rd or 2nd century B.C. Fragments of a zinc coffin was reported to have fairly recently been discovered in Israel, which, judging by an artifact found nearby, dates back to 50 B.C. Caustic soda and lye are synonymous. "Clothes were cleansed in antiquity," according to Charles Singer, by "lye from natron or wood-ash," [iv] so it was available for use as an electrolyte to activate powerful electric cells in antiquity. Manmade sulfuric acid (sulphuric acid) has been around at least since the seventh century B.C., and natural sulfuric acid has been available to use as an electrolyte for countless years before then. An article in Harper's New Monthly Magazine, under the title of "Secretion of Sulfuric Acid by Mollusks," points to where both modern and ancient man could have obtained natural sulfuric acid. "The remarkable fact was announced some years ago that certain gastropod mollusca secrete free sulfuric acid; and this has since then been not infrequently observed in the case of the gigantic Dolium galea, which discharges from its proboscis a drop of liquid or saliva that produces a very sensible effervescence on chalk or marble. This secretion from different mollusca, carefully analyzed, showed a considerable percentage of free sulphuric acid, some of combined sulphuric acid, combined chlorohydric acid, with potassa, soda, magnesia, and other substances; the glands secreting the liquids constituting from 7 to 9 per cent of the total weight of the animal. With this acid secretion there is, at least in some species, an evolution of pure carbonic gas, one gland, weighing approximately about 700 grains, yielding 206 cubic centimeters. However, the ancients probably did not need to rely on any natural source of sulfuric acid for the electrolyte in their batteries. They likely, as today, relied on their ingenuity to manufacture their own. "The sources from which our knowledge of Assyrian Chemistry is obtained are a very small part of the collections of cuneiform tablets in our museums, which may perhaps be reckoned at a quarter of a million roughly in number, and of this chemistry, almost all our knowledge comes from tablets of the Seventh Century B.C. But that the ancient Sumerians had a very practical knowledge of chemical methods even before the invention of writing, let us say, very early in the Fourth Millennium B.C., is to be inferred from the beautiful gold work found by Sir Leonard Wooley at Ur, and the copper and bronze castings found throughout Southern Mesopotamia. The written word, however, of their methods has survived only sparsely by comparison, this being due to three causes: first, the illiteracy of the craftsmen; secondly, the habit of all Guilds to conceal their methods by the use of cryptic expressions; and thirdly, the close guarding of secrets, which were frequently handed down from father to son by word of mouth. "In the Seventeenth Century B.C. we have a text of outstanding importance for the history of Chemistry in a tablet written by a glass-maker. Later on, in the Seventh Century, we have a collection of glass recipes made at the instance of King Ashurbanipal (668 - 626 B.C.). More generally we have a large collection of medical texts which allow us to identify numerous substances in use during the First Millennium B.C. Finally I must mention numerous Sumero-Assyrian dictionaries which give lists of chemical words, also dating from the same period. Now that we have established that the ancients also possessed all of these chemicals, including Sal Ammoniac and sulphuric acid, which are excellent battery-making materials, we need to look at least one example of a primary and second type of powerful battery that they could have easily produced to energize their ancient electric lights. One example of a powerful primary battery that the ancients could have manufactured, using caustic soda or some equivalent, is the Lalande Battery. Felix Lalande and Georges Chaperon used a similar electrolyte to produce their primary battery in the nineteenth century, and it supplied enough current to power electric railroad lights for many days before it needed to be restored. Likewise, several large Lalande cells placed in series and parallel could have supplied enough voltage and current to power bright lights in antiquity for a long time before any of the battery's elements would have needed replacing. This type of battery needs no external source of electricity to revitalize it. After it has discharged, replacing some of its internal ingredients restores the unit to full capacity. 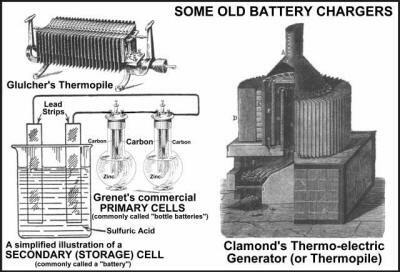 In an Encyclopaedia Britannica article published in 1929, G. W. Heise, a research chemist at the National Carbon Company of Cleveland, Ohio, and an author of numerous articles in technical journals, explained the "heavy-duty characteristics" of this primary battery - which would certainly qualify it for carbon arc light usage in the searchlight on the ancient Pharos Lighthouse. "The Lalande cell is one of the most efficient and satisfactory primary batteries known today for the special classes of service to which it is suited. It lends itself readily to rugged construction; it is relatively cheap to make and operate; it is very reliable in its action and has a high current output per unit of volume (about 1 ampere hour per 8 cc. of electrolyte). The cell is made in units as large as 500 to 1,000 ampere hour sizes. Because it requires no attention for long periods of time and because of its excellent continuous discharge and heavy-duty characteristics, the Lalande cell is at present much used in railway signal operation. It can be made in dry or non-spillable form either by gelatinizing the caustic soda solution with small quantities of starch or by using such expedients as making a paste out of electrolyte and mag­nesium oxide. "Air cells of the Lalande type, in which a porous carbon acces­sible to air is substituted for the usual copper oxide element, are also feasible. These have an even more horizontal discharge curve than the copper oxide cell, since the potential of the cathode remains virtually unchanged during service life. 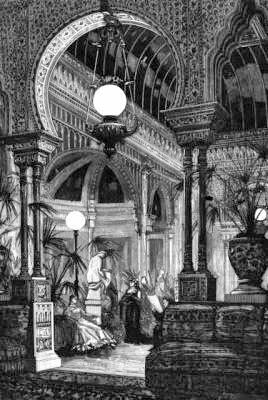 A railroad signal light sending directions down the track, like the Pharos flashed it messages over the sea, certainly demanded their periodic renewal, but eventually a more practical and economical source of illuminating power, the lead-acid secondary storage battery took its place. 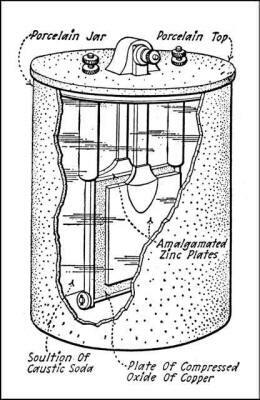 This powerhouse is easy to build, by immersing two lead plates in a solution of sulfuric acid in a glass container, all of which the ancients possessed. However, before a simple storage cell will produce electric current, it needs charged. To initially energize it, you need only to connect it to a source of direct current, like a primary battery or thermocouple. 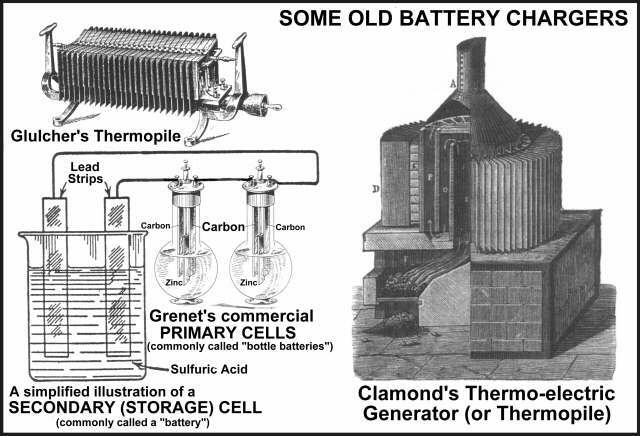 We already know the ancients manufactured primary cells, like the Baghdad batteries, that serve the purpose, but they could have easily used a thermo-electric generator, which is a simple device to make. They merely had to heat one of two dissimilar metallic conductors joined together, like copper and iron, to create a thermo-electric generator, which is also called a thermopile and thermo-electric stove. The Gülcher Thermopile, being more convenient, less costly, and cleaner than primary batteries, was a popular means of charging storage batteries in the nineteenth century. It gave on a short circuit about 5 amperes of current at 4 volts. However, this thermo-electric generator hardly compared to the power output of the improved Clamond Thermopile of 1879, which produced 109 volts, with an internal resistance of 15.5 ohms. It could easily illuminate bright electric lights and also deliver a lethal dose of energy! In 1893, Dr. Giraud's Thermo-electric stove, 3 feet high and 20 inches in diameter and fired by coal, not only could charge batteries but could also light several electric lamps, as well as heat a room 21 feet square. It was an expensive unit to build but cost would have been no obstacle for a wealthy ruler of any ancient city like Alexandria. The ancient Greek kings ruling that city may well have relied on similar types of thermopiles to charge powerful lead-acid batteries hooked to the arc light on the Pharos lighthouse, an essential element for shipping safety and the city's commercial survival. Lead-acid storage cells will produce a voltage of about 2 volts each, and the ancients could have easily connected several of them in series and parallel to create a powerful battery. Hooking its poles up to a couple of chunks of carbon from the remnants of a wood fire, touching the two together, and separating them a certain short distance will ignite a brilliant arc of light. That is child's play. And it would not have taken long for them to realize that maintaining that distance will sustain a brilliant carbon arc light - the kind that would eventually be reflected from the huge mirror on the Pharos Lighthouse. It certainly does, and even more so if we consider what some renowned Egyptologists observed and some of the astonishing ancient lighting testimony that cannot be easily explained otherwise. How could this be - when the ancient Egyptians emblazoned on their monuments almost every other important innovation that shaped their daily lives? Perhaps, like a more contemporary authority, Robert Temple, [ix] observed, concerning all the previously unrecognized ancient lenses stashed away in the world's museums, the answer lies in the fact that people are not looking for ancient electric lights so they simply do not recognize them. Wilkinson's observation reminds us of what the prominent astronomer Sir J. Norman Lockyer, who also studied ancient Egyptian temples and tombs in depth, noticed in 1894. The extensive proofs provided in The Electric Mirror on the Pharos Lighthouse and Other Ancient Lighting [xi] clearly demonstrate that "possibility." This work also includes excellent reproductions of the extraordinary ancient illustrations discovered on the crypt walls beneath the Temple of Hathor (Isis) at Denderah. They seem to clearly portray electric carbon arc searchlights and filament bulbs. Priests apparently used them to illuminate the temple as well as various tombs - and more importantly, the mighty Pharos Lighthouse. So M. Bouriant's casual suggestion that the ancient Egyptians may have employed electric lights is no longer a laughing matter. Deep, dark tombs like this one would have required an electric light to illuminate them enough for ancient artisans to have embellished their walls with the correctly colored and finely detailed images of the deceased's life. They could never have succeeded with the light from dim candles, sloppy oil lamps, or smoky torches that would have starved them of essential oxygen and left unsightly soot marks clinging all over the tomb walls and ceilings. Several writers have suggested that the ancient Egyptians illuminated their tombs by reflecting rays of sunlight with an arrangement of mirrors. However, light-absorbing mirrors are not a good option for pressing and complex projects demanding more than the Sun's periodic appearance - in cloudless, dust-free, daylight skies. Beside this, the maze of rooms in some tombs would have caused insurmountable problems for technicians trying to keep a large number of mirrors critically aligned and continuously tracking one another as they tried to catch and bounce around the diminishing rays of our elusive sun. Moreover, some technician or artisan confined in a complex Egyptian tomb would have eventually stepped in front of one of the reflectors and have broken a critical link in the intricate chain of light - abruptly leaving others down the line struggling in total darkness. Furthermore, artisans using oil-fired lights could have never completely removed the soot from the ceilings and walls after finishing their tasks because they would have had to clean up the smudge with the same smoke-belching lights that produced it. So how else, other than with the use of clean-burning electric lamps, could they have managed to meticulously decorate about 400 underground grave systems with no trace of any smoke residue? Of course, some tombs now show soot marks left from the oil lights of grave robbers who had previously violated them - but Lockyer spoke of "freshly-opened tombs." Beside all this common sense that strongly supports the need for ancient electric lighting stands several outstanding examples of ancient testimony that cannot be reasonably explained in any other way. In the second century, a Syrian temple sheltered a statue of a goddess with one of these types of lights mounted on her head. This obviously seems like some type of electric light since Lucian clearly called the stone a "lamp" - and it was powerful enough to light up the whole temple. Furthermore, an electric light, any type for that matter, typically shines brightly at night and very dimly in the daytime. 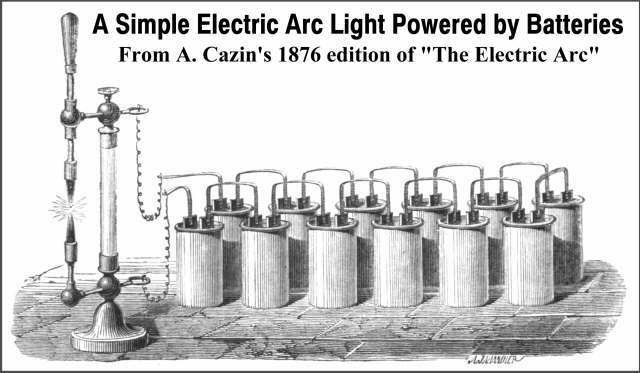 However, since Lucian called the lamp a "stone," perhaps it was the only way he knew how to describe carbon, the carbon of a simple electric arc lamp. And, since he said it had a "very fiery aspect" in the daytime, this makes us think that it might have been some kind of fiery carbon arc light - like those used to illuminate nineteenth-century cities and to power searchlights. "There was, and still is, a temple of Venus, in which a lamp burns so strongly in the open air that no storm or rain extinguishes it." 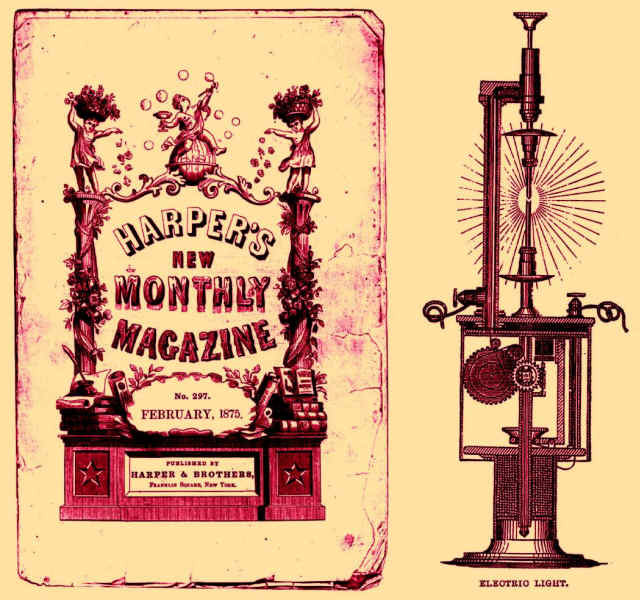 He blamed "the reality" of this marvelous lamp, likely an electric arc light, on the miracles of the "black arts" performed by demons and men [the illuminati]. "We add to that inextinguishable lamp a host of other marvels of human and of magical origin - that is miracles of the demon's black arts performed by men, and miracles performed by the demons themselves. If we choose to deny the reality of these, we shall ourselves be in conflict with the truth of the sacred books in which we believe. "asbestos stone, which has no fire of its own, and yet, when it has received fire, blazes so fiercely with a fire not its own that it cannot be quenched." This points to the carbon in an arc light receiving its fire from an electric source - an ancient battery - "not its own." "It is quite independent of the action of the air." Furthermore, he also claimed "no storm or rain extinguishes it." A couple of hundred years later, carbon arc light technology still survived. Electric searchlights nightly lit up Jerusalem then, and a substantial portion of it at that, by casting their beams a great distance from another holy edifice - the circular Church of the Ascension on the Mount of Olives. Arculf (Arculfus), a Frankish bishop, perhaps of Périgueux, who visited and explored the Holy Land, accompanied by Peter, a Bergundian monk, who acted as a guide, reported the details and effects of eight brilliant lights - and some others also. "St. Bede relates (Hist. Eccles. Angl., V, 15) that Arculf, on his return from a pilgrimage to the Holy Land about 670 or 690, was cast by tempest on the shore of Scotland. He was hospitably received by Adamnan, the abbot of the island monastery of Iona, to whom he gave a detailed narrative of his travels to the Holy Land, with specifications and designs of the sanctuaries so precise that Adamnan, with aid from some extraneous sources, was able to produce a descriptive work in three books, dealing with Jerusalem, Bethlehem, the principal towns of Palestine, and Constantinople. Adamnan presented a copy of this work to Aldfrith, King of Northumbria in 698. It aims at giving a faithful account of what Arculf actually saw during his journey. As the latter 'joined the zeal of an antiquarian to the devotion of a pilgrim during his nine months' stay in the Holy City, the work contains many curious details that might otherwise have never been chronicled.'" The following two excerpts, from The Pilgrimage of Arculfus in the Holy Land (About the Year A.D. 670) was translated by the Rev. James R. MacPherson in 1895. "The translation has been made as literal as possible in passages where the exact rendering was of any controversial or archaeological importance, as in the description of the sites and buildings." "In the western side of the church we have mentioned above [before], twice four windows have been formed high up with glazed shutters, and in these windows there burn as many lamps placed opposite them, within and close to them. These lamps hang in chains, and are so placed that each lamp may hang neither higher nor lower, but may be seen, as it were, fixed to its own window, opposite and close to which it is specially seen. The brightness of these lamps is so great that, as their light is copiously poured through the glass from the summit of the Mountain of Olivet, not only is the part of the mountain nearest the round basilica to the west illuminated, but also the lofty path which rises by steps up to the city of Jerusalem from the Valley of Josaphat is clearly illuminated in a wonderful manner, even on dark nights; while the greater part of the city that lies nearest at hand on the opposite side is simi­larly illuminated by the same brightness. The effect of this brilliant and admirable coruscation of the eight great lamps shining by night from the holy mountain and from the site of the Lord's ascension, as Arculf related, is to pour into the hearts of the believing onlookers a greater eagerness of the Divine love, and to strike the mind with a certain fear along with vast inward compunction." 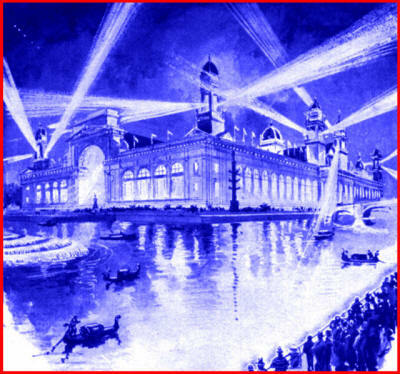 Ancient candles and oil lamps could never have begun to light up a "whole city" a mile away, but Arculf's electric mirrors (searchlights), as described above, were quite adequate. However, the wily priests maintaining the bright lamps in ancient lighthouses, temples, and tombs kept their searchlight technology a secret because they needed to inspire their naïve flocks to revere their religion. Yet, they could not resist bragging to succeeding generations of illuminati - by cleverly emblazoning their electrical wisdom on their monuments. Unfortunately, until relatively recently, not many people have taken seriously the ancient electric lighting testimony left to us - although the proof and techniques have stood out in front of our eyes for thousands of years now. The ancient electrical wizards must be disgusted with their failure to induce productive observation in modern generations, or perhaps they are laughing loudly somewhere at our blind wisdom of the past instead. 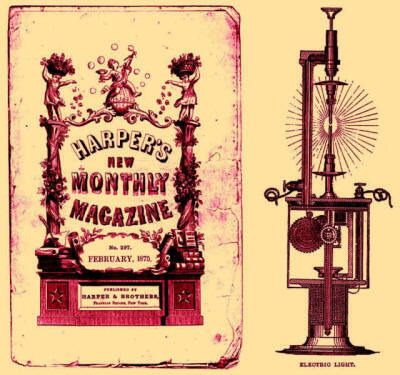 What electrical truth Edison and others stumbled onto in the nineteenth century is merely old wine poured into a new bottle, and the bible verifies this by maintaining that there is nothing new under the sun. Yet, our pride often seems to stand in the way of accepting the fact. However, one wise writer set this human weakness aside and boldly admitted the truth - over a century ago! "Whenever, in the pride of some new discovery, we throw a look into the past, we find, to our dismay, certain vestiges which indicate the possibility, if not the certainty, that the alleged discovery was not totally unknown to the ancients," wrote Madame H. P. Blavatsky, in Isis Unveiled. 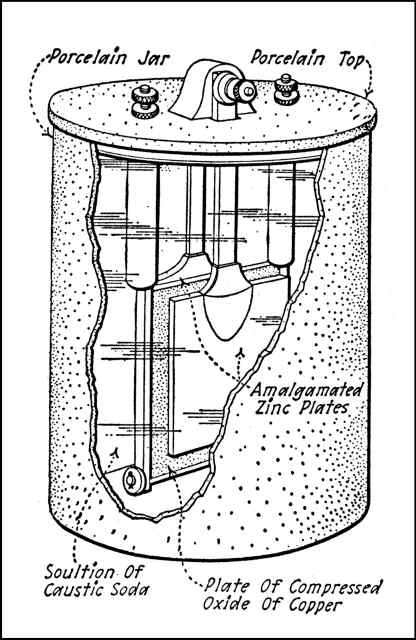 [ii] Under SCIENCE ARTICLES in the March 1939 issue of ASTOUNDING magazine, Willy Ley's article was listed on the contents page as "ELECTRIC BATTERIES - 2,000 YEARS AGO! SO YOU THOUGHT OUR CIVILIZATION FIRST DISCOVERED ELECTRICITY?"